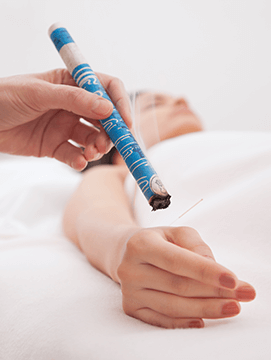 Everyone has heard of acupuncture these days, but a lot of people still don’t know about moxa (or moxibustion) – A powerful additional tool in the acupuncturist’s toolbox. Moxibustion is the technical name for the burning of the herb called moxa (Chinese mugwort) to provide heat and provide an alternative way of stimulating acupoints, channels or areas of the body. It’s inseparable from acupuncture, and the Chinese word zhēnjiǔ, normally translated simple as ‘acupuncture’ actually means ‘acupuncture and moxibustion’. 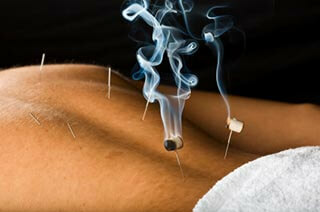 The heat from burning moxa penetrates deeply into the body, warming and nourishing the tissues. It encourages healing, improves circulation and strengthens nerves, tendons and organs. The moxa itself is a light, downy substance (actually the dried leave of Chinese Mugwort), which can be used either loose or in a number of prepared forms. The most well known way of using it is is called ‘warming needle‘, where a tightly squeezed pile of moxa, or a ready-made piece of compressed moxa, is placed on the end of a needle and lit (see picture above). As it burns down, the needle warms up, and transmits heat into the body. This stimulates the acupoint in two ways – by needling and by heat, and this will have a different effect to needling alone. In a way, the application of heat to an acupoint is a way of asking it to do something slightly different to what it does when needled. Specifically, moxa helps to heat the body up, and strengthen both Qi and Yang. It helps in certain cases of stagnation, as the Heat helps to get things moving. For instance, it can sometimes be very effective in the treatment of osteo-arthritis, especially in cases where the pain is worse in cold weather. There are lots of other ways to use moxa, too.. Direct moxa (above) is where the moxa is pressed into a small cone and then applied straight onto the body. It burns down until it starts to get warm, and then it’s taken off to prevent burning. It can also be placed on top of some kind of insulating material, which is then placed on the body (indirect moxa.) The insulating layer stop burns, and usually has a therapeutic use of its own. Traditionally a slice of fresh ginger is used, and the warm ginger and juice enhance the Moxa’s heating effect. Moxa on ginger is sometimes used on 5 particular points on the abdomen called ‘the wheel of life‘ – it’s great for a range of digestive conditions like IBS, and with a slight modification can be used to help with infertility and urinary problems. More elaborate and advanced indirect moxa techniques include Dragon Moxa, where a large amount of moxa is burned on a thick ‘cake’ of grated ginger placed along the spine. This powerful technique is good for severe deficiency (eg chronic fatigue syndrome / ME), and certain neurological conditions. Finally, a moxa stick (left), something like a cigar made of tightly pressed moxa, can be used on a point, channel or any part of the body – one end is lit and then it is held over the relevant area. It provides a surprising amount of heat, which really penetrates deeply inside. The one downside with moxa can be the big plumes of smoke that it gives off, and this prevents many practitioners from using it as much as they’d like to. At first the swirling smoke looks good (and makes for great photos! ), but it soon fills a room. 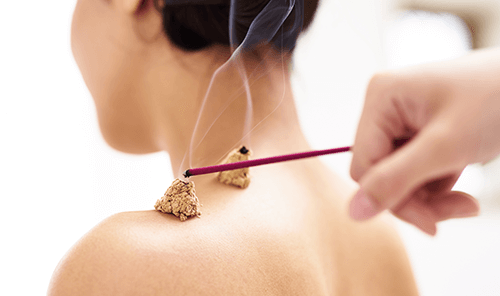 Plus, the smell is strong, and although not unpleasant, is surprisingly similar to marijuana – this can occasionally give an uninitiated passer-by quite the wrong idea of what’s going on inside the acupuncture clinic! So, to avoid getting smoked out, many acupuncturists use smokeless moxa, a kind of moxa infused charcoal, which can be used in all the same ways as the traditional herb. But while this is certainly convenient, it is debatable how much actual moxa is in these smokeless forms, and many practitioners (myself included) are going back to using ‘real’ moxa for a better effect. In fact, I’ve just finished building a moxa-smoke extractor for my Bristol clinic (dubbed ‘ THE MOXATRON’), so I can get the best of both worlds – pure moxa effect, and no smoke! Moxa is also a valuable part of the ‘Yang Sheng‘ tradition of strengthening and bolstering overall health and well-being. Moxa treatments carried out regularly, or at certain times of year, help to strengthen Qi and prevent disease. 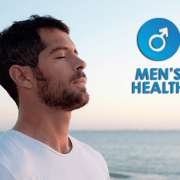 They are especially beneficial just before or during Winter, or at times of great stress or heightened demand on the body and mind, and they become more and more useful the older you get. Many of the classic texts recommend a yearly moxa session to keep energy strong, and old age at bay. 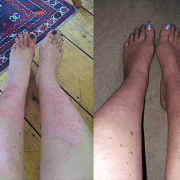 I recently gave myself a strong moxa treatment in advance of my trip to China, to help me to cope with the long-haul flight, different food, and lack of sleep – this is another traditional use of moxa, as a prophylactic treatment for traveling. And as I wasn’t at all put out by jet-lag, and handled all the street-food without so much as a grumbling tummy, I’m sure it helped!